There are several teams dedicated to providing technical support and on site assistance for the SMU community. If you need assistance from any of our teams, don't hesitate to contact the IT Help Desk! They will be sure to connect you to the right resource in OIT. We look forward to serving you. Providing IT support to the entire SMU campus community. 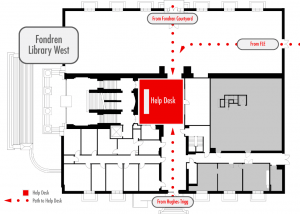 The Help Desk is located in the Fondren Library West lobby, adjacent to the Collaborative Commons and Starbucks Café. Semester Hours begin the first day of class and end on the last day of exams. Walk-in hours dependent on CUL hours, smu.edu/cul. The Help Desk provides support to the entire campus community. In addition to supporting current faculty, staff and students, the Help Desk provides limited assistance to retirees, parents and prospective students. All of the Help Desk staff are HDI certified and are committed to providing exceptional service. The Help Desk is available to answer questions regarding any of the services that IT provides and any of the software applications that we support. They are able to assist with network configurations, software troubleshooting and training, email support and configuration, and more. The Help Desk staff uses remote tools as well as a shared knowledge base to help provide resolutions to reported issues as quickly as possible. All requests for assistance are documented in the Help Desk software. If the Help Desk is unable to resolve the issue, the ticket will be routed to the appropriate IT technician for resolution. The Help Desk makes every effort to respond to each request the same day it is received. In order to ensure that your requests for assistance are handled in a timely manner, service level agreements have been configured in the help desk software. Each help request is assigned a priority based on the severity of the request. The "clock" starts running the minute the request is opened. As each threshold is exceeded, additional notifications are sent to the assignee to ensure that each help request is resolved appropriately. The default SLA and thresholds appear below (business hours are calculated as 8-5 Monday through Friday). There are a number of teams that are dispatched to the various offices or locations to provide specialized support. To view the list of personnel, consult the OIT Org chart. A team of 9 consultants are distributed throughout main campus to provide on site or in depth remote support to faculty and staff. Requests for assistance should be directed to the help desk first. If they are unable to resolve the issue, they will engage the embedded support team to assist. OIT provides hardware repair services and computer installation services for campus faculty and staff. Emergency response to classroom technology support is provided by multiple teams within Customer Service. IT personnel are also available onsite on the Plano campus and Taos campus. The Academic Technology Service Directors, stationed within each school, provides valuable consultation and assistance to faculty and staff. A team within the Client Services team is responsible for overseeing the various computer labs on campus. They ensure the computers are functioning properly, updated regularly and maintained. In addition to the teams above, all of OIT is eager to serve the needs of our campus community. Simply contact the IT Help Desk and they will be sure to connect you with the correct resource.